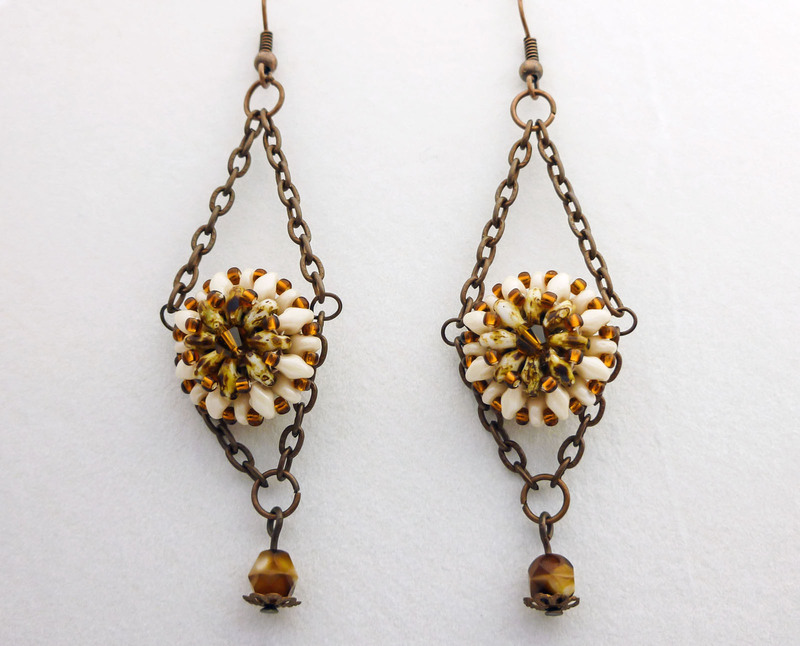 This earring is a design by Barbara Falkowitz, published in Beadwork Magazine June/July 2013. It's very easy and fast to make. 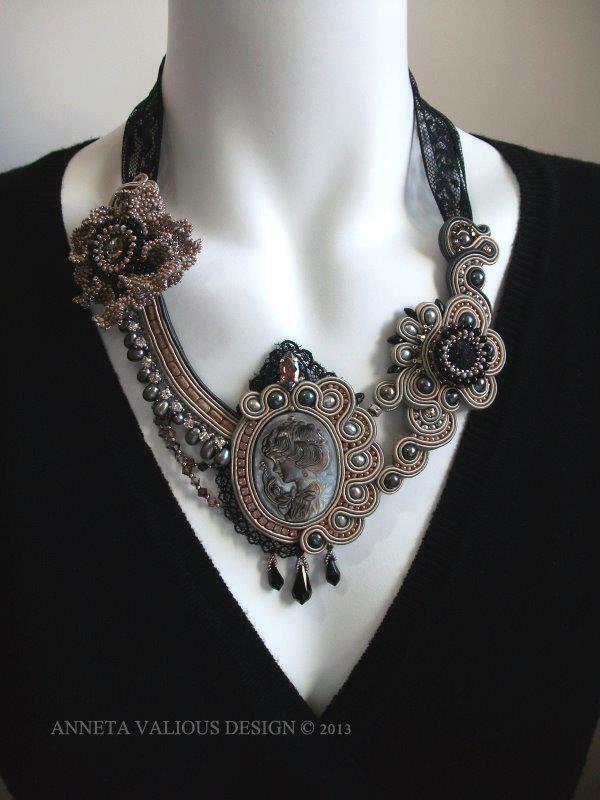 And the result is stunning! 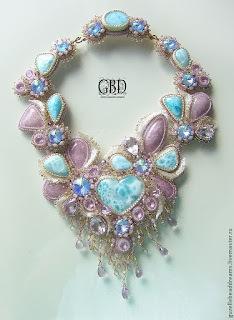 I think this project could be a good adventure for the weekend of those who are learning beadwork! 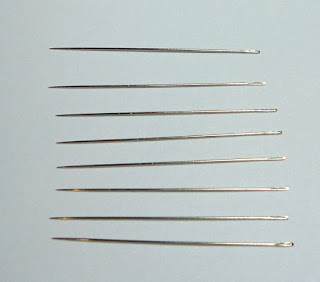 Beading needles are very similar to sewing needles. The difference is that the beading needles are much thinner and have smaller eyes. You can't pass through a seed bead with a sewing needle. The beading needles came in different sizes based on their thickness and length. The size of a traditional beading needle is identified by a number: #10, #11, #12, #13, and #15. The higher the number, the finer the needle (and the needle eye is also smaller). 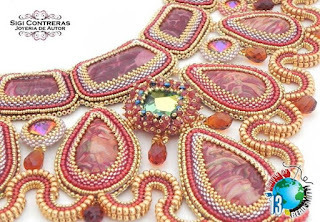 You will choose the needle according to the type of beads, the thread size, and the type of project you will do. 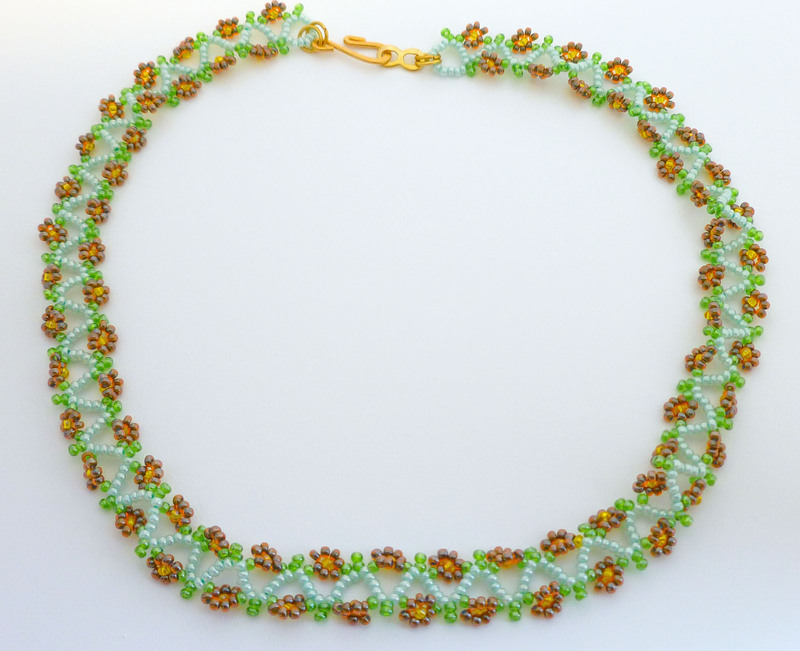 For example, if you are using seed beads size 15/0, which are the smallest beads, it is ideal that you use at least a beading needle #12. 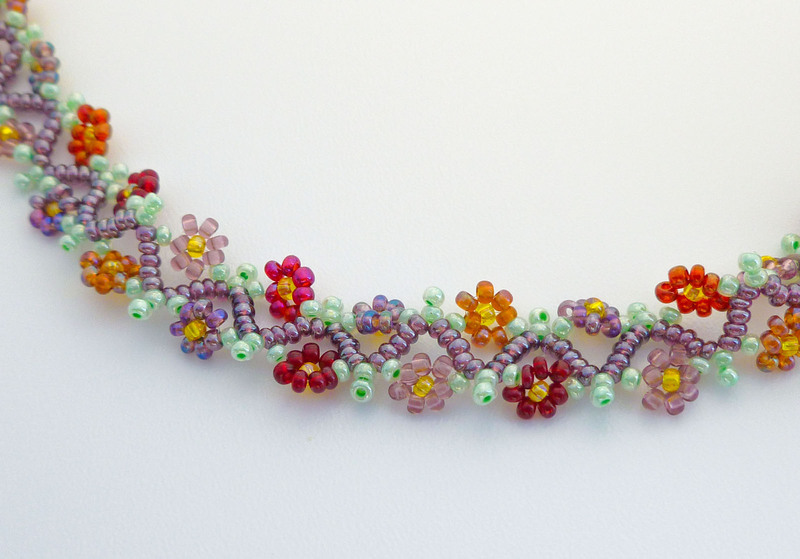 Or if the seed bead 11/0 is the smallest bead of your work, you can use a beading needle #10. But if the project asks you to pass many times through the same bead 11/0, then it's better you get a thinner beading needle like #11. The type of thread also influences the needle's number size choice, because the thinner the needle, the smaller the needle eye. So, thicker threads ask needles with smaller needle's number sizes. The needles most used are #10, #11 and #12. Until now I didn't need a needle thinner than #12. But this will depend largely on the type of project you will work. The beading needles also varying in length. There are the traditional beading needles with a normal length, the short beading needles (shorter than the traditional one), and the extra long beading needles (longer than the traditional one). Some people say that the short needles are good for embroidery on fabrics. I don't recommend these needles unless you already have some experience. If you're starting out, it is best you buy needles with normal length. Big Eye Needles: the needle's eye runs its length. These needles allow you use any kind of thread, cords, ribbons, and yarns. 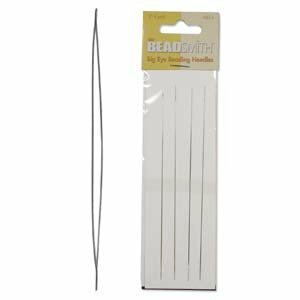 They are thicker than the traditional beading needles, but still you can use it in most off-loom projects with beads size 8/0 or larger (and even some japanese seed beads size 11/0). I especially like to use this needle with the illusion cord, which is very thicker to pass through the eye of a traditional beading needle. Twisted beading needles: This is another type of needle with a larger hole that allows use thicker lines. When you pass the needle through the beads, the needle's eye collapses, making possible pass the needle easily through the bead. They are great to work with pearls and gemstones. But because their eyes are a bit larger and rounder than other types of beading needles, they aren't generally used with seed beads. 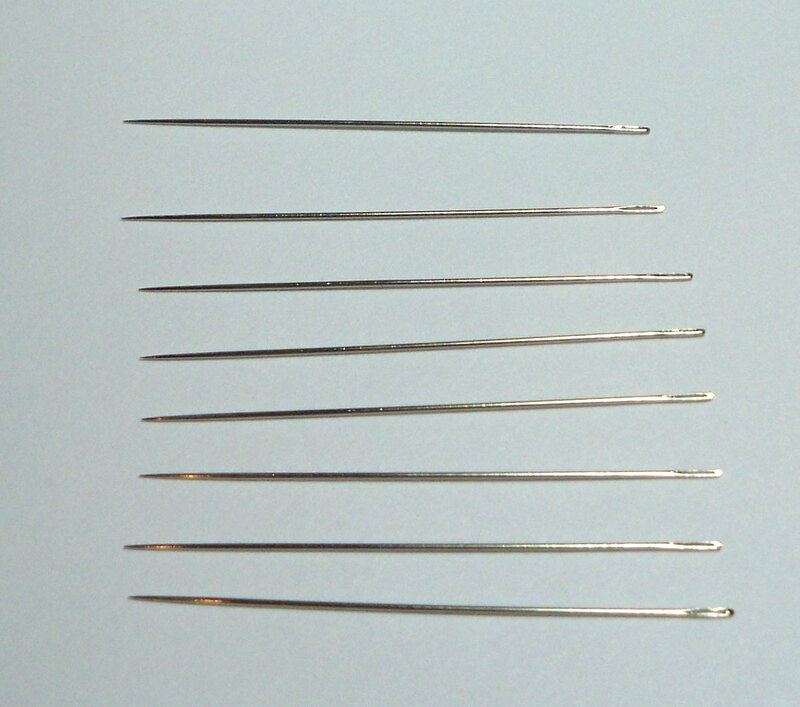 There are different brands of beading needles on the market. Some brands are more expensive than others due the quality. Economy needles are generally softer and tend to curl and bend. I suggest you test some different brands of needle to find out those you like more. Beadwork is any kind of work with beads. 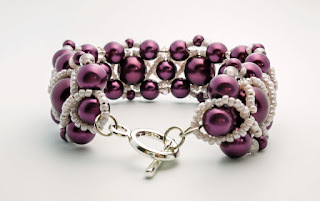 If you search on the Internet you'll can see countless beautiful things that are created with beads: fashion accessories (like jewelry, handbags, shoes and clothing), objects, miniatures, and sculptures art. 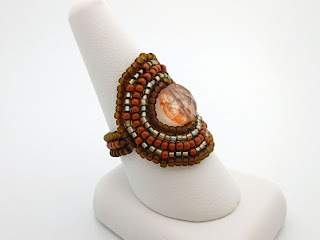 In this blog I talk especially about the creation of beadwork jewelry. And for those who have no knowledge about this technique but is interested in learning, I am creating some articles and videos to help you. 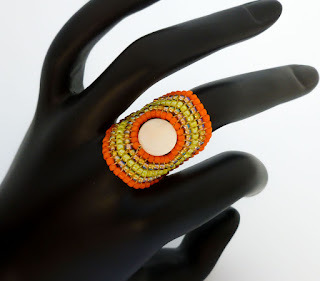 In the articles I will talk about the basic materials (tools and all kinds of beads), and in the videos I'll show you how to do some basic stitches like spiral hope, peyote, netting, square stitch and herringbone, among others. The articles will be rich in pictures to help you identify the materials and techniques. Few weeks ago I bought the digital edition of Favorite Bead Stitches magazine. It has a collection of selected patterns published on Beadwork Magazine until year 2010. They categorized the projects by stitches, what I think is wonderful for those who want learn a specific technique. For continuing my learning in square stitch, I chose the project Casual Cocktail Ring from the magazine. My first piece using this technique was the Golden Zig-Zag Bracelet. 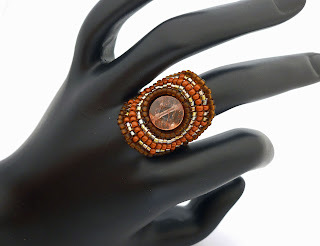 The ring is totally made using that stitch: the ring center is made with circular square stitch and the ring band is made with flat square stitch. I had some problems to do the ring center in circular square stitch. In my first try, even following properly all the instructions, I got a ruffle round piece. It took me a few tries until I figure out how I should work to keep the circle flat. First of all you can't keep your tension too tight. You need keep it a little bit loose (but not too loose!) to leave enough room to the beads sit side-by-side. 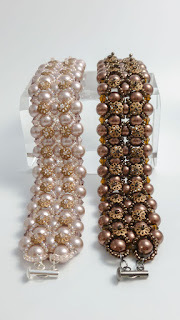 And the quantity of increases you'll make in each round will depend on the beads you are using. 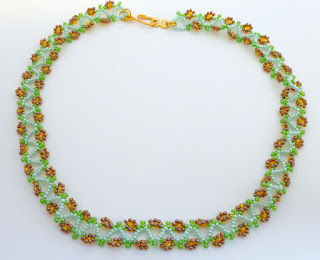 I used Delica beads 11/0 and Toho seed beads 11/0 in two different finishes. 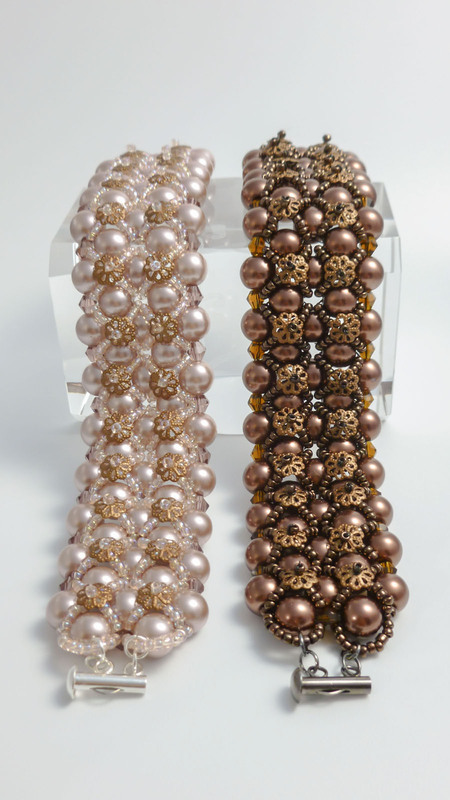 The Toho seed beads are very regular in shape and size, but you can notice a little difference between the size of seed beads with different finishes. I believe that's the reason of my piece became ruffle. So, I made some adjustments in the original pattern by changing the amount of increases. And finally I got a perfect round and flat piece in circular square stitch. I was so happy with the result that I made a second ring. The second ring was very quick to make. Once you get the hang of the circular square stitch it's easy to figure out when make the increases and keep it flat. I'm not sure if this bracelet is good for beginners. 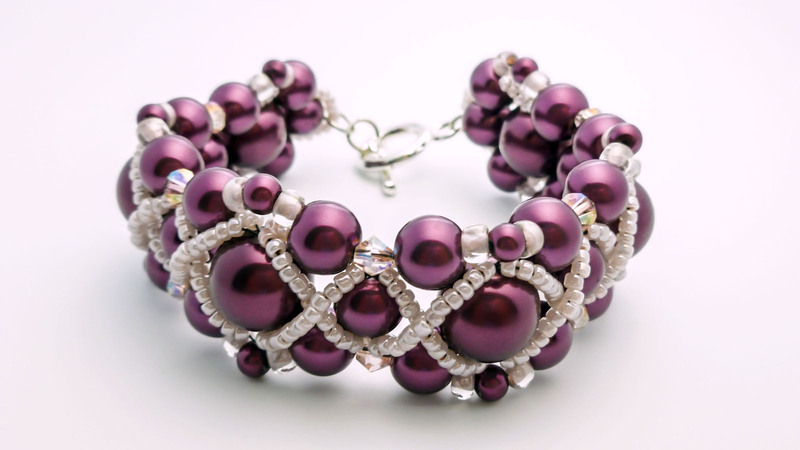 It's easy to do but if you never tried beadwork before I recommend you try easier patterns first, like the pearl ring or the pearl bracelet. I did the base of the bracelet using the right angle weave with two needles (but as I used nylon thread 0.25mm, I didn't need the needles!). And to make the embellishment part I didn't use any specific technique... just beadweaving and crossweaving. I tried to get good pictures to show how beautiful are the bracelets but I wasn't successful. It's too hard for me to get pictures that shows the real color and the real shine of the piece. 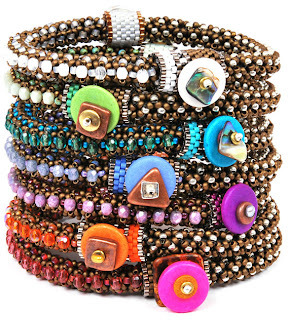 But I hope the photos can encourage you to try to make a bracelet. You will not regret it! 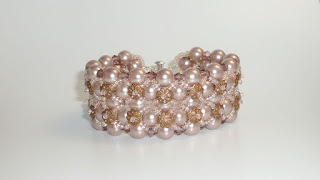 I created this bracelet using the pearl ring's design as a base. 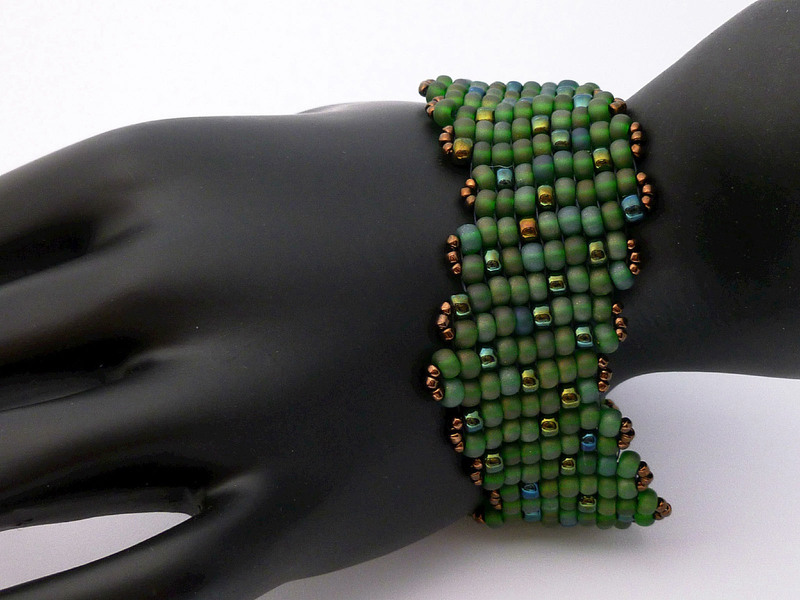 I made several modifications on the original pattern to transform it into a bracelet. 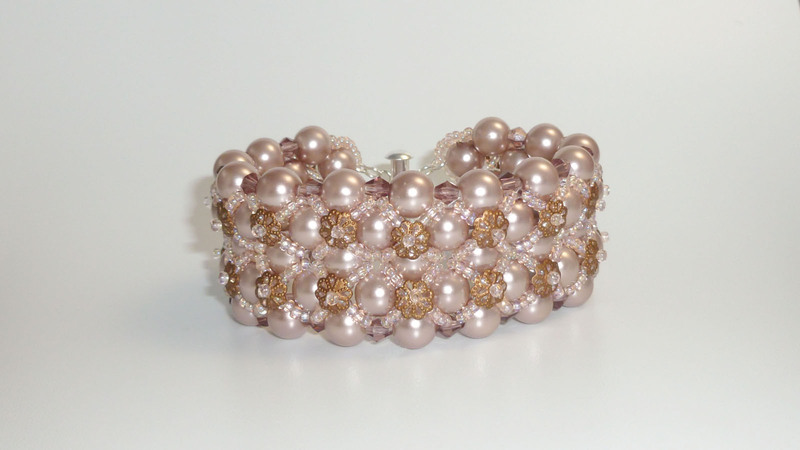 As well as the ring, the bracelet is very easy to do. 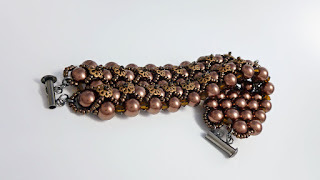 Pretty soon I will be posting a video tutorial showing you all the steps necessary to make it, including how to finish the thread and how to add the clasp. This bracelet is a Tina Koyama's design. It was published on Beadwork magazine in June/July 2006. 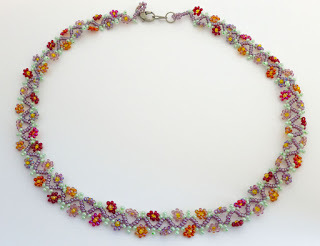 But I got it in the Favorite Bead Stitches, 2010 magazine. You can also buy only the tutorial in the interwave store. Tina Koyama is a mixed-media artist. 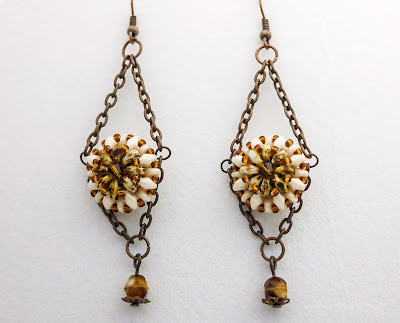 She makes beautiful beadwork jewelry, sculptures using cotton cords, collage, and paintings as you can see at her website: http://www.tinakoyama.com/. 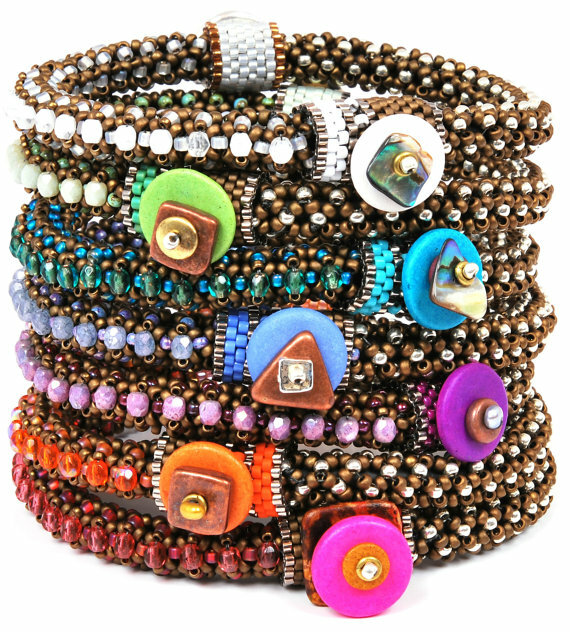 She also works at FusionBeads by writing jewelry instructions and designing beading kits for the site, among others. 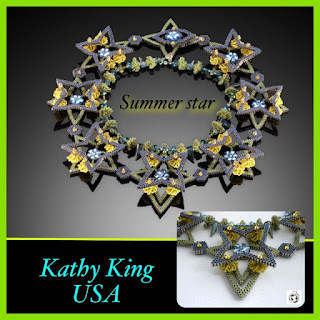 You can find a lot of other Tina's jewelry tutorials published on Beadwork magazine here. The 'Zig Zag Bracelet' is a good way to practice the increasing and decreasing with square stitch. The material you'll need is delica beads 8/0, seed beads 11/0 and a button for the closure (plus needle and thread, of course!). 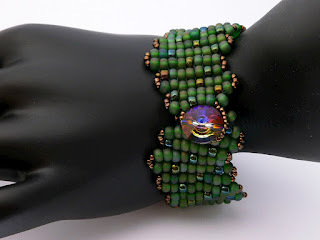 In my version of this bracelet I used round seed beads 6/0 because I had no delica beads at the time. But I really think you can use almost any type of beads in this project! Cubes, triangles, hexagon, bugle beads... the possibilities are endless! 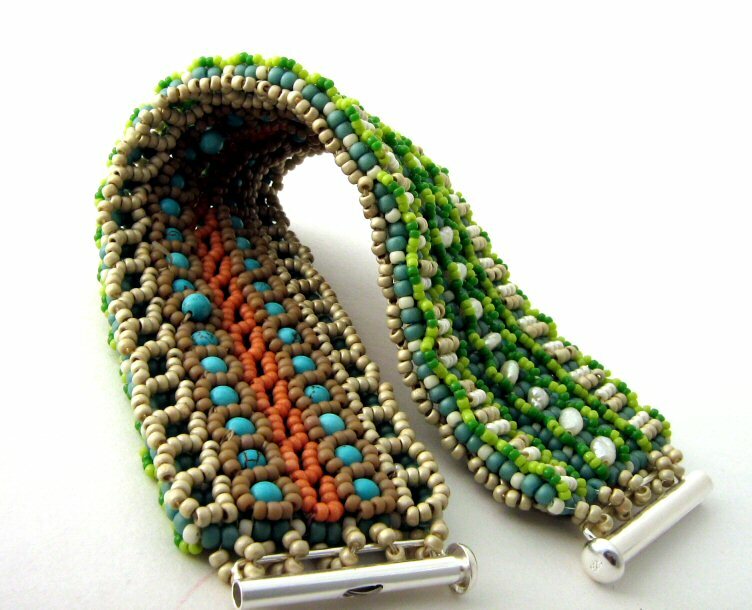 However I think the zig zag of my bracelet became somewhat less pronounced because I used round seed beads 6/0. And my bracelet was longer than the original pattern: it got 18cm (a little bit more than 7"). But I liked very much the result. It's a gorgeous design and I recommend you try it using the type of beads you have on hand!